With the oldest car yet, cross-dressing maids, and a crash-and-roll finale, the Buttonwillow Histrionics 24 Hours Of LeMons was a rod-throwin' success! Let's take a look at how all 95 citrusy racers fared. 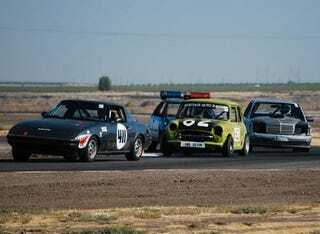 And The REAL Buttonwillow Histrionics Winner Is... The Mr Bean Austin Mini! It appears that the Honda teams have finally found some way to keep those head gaskets intact and the rods safely inside the block, with Hondas and Acuras doing very well in the Buttonwillow heat. The fast track led to some bent metal, but nothing approaching the demolition-derby-style carnage of the early Altamont LeMons races. Thanks to Nick Pon and LTDScott for their photographic help.